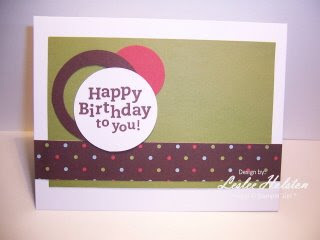 I've made this card for a young man's birthday. Adam has been invited to the party and his only request was that I NOT use flowers. Hmmm.... When I asked, Adam said that cupcakes are fine. I immediately pulled out the cupcake from 'Wagon Full of Fun' found in the Occasions Mini catalog. Also, I knew that I wanted to use circles. 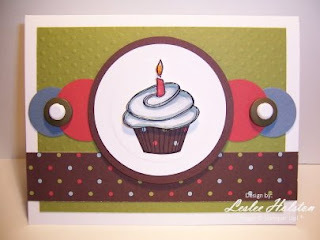 I recently received my new toy from Stampin' Up! - the new Circle Scissor Plus! I had to play, of course! Then, I checked out Jen's Sketch For You To Try. There sat a sketch full of circles! Perfect!! This card went together very quickly for me (and I needed that today). And a close up... I textured the background using the Big Shot Backgrounds #1 Texturz plate - sm. dots. The circles were all cut using the Circle Scissor Plus. I dry embossed the white circle by placing a smaller cut circle behind it and rubbing my stylus around it (I don't own Nesties...yet). The cupcake paper cup was paper pieced and the frosting top was colored using markers and a blender pen and I applied Crystal Effects to the 'folds'. 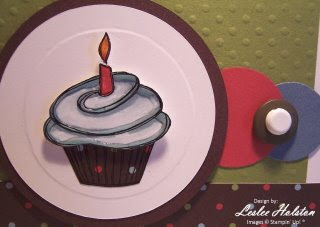 I then cut it out and placed it on a Stampin' Dimensional. I should have stamped and colored it twice but I took a short cut today. The white brads were put through the Artichoke button holes (an Adam pick). It adds nice visual dimension to the card. Adam likes the card and I'm sure his friend will too (I know his mom will appreciate it). Thanks for stopping by today! I hope you've been inspired to stop by Jen's and give her sketches a try! They are awesome! Thanks for the inspiration you've given me Jen! cute cards!!! Love the cupcake one! like how you used the button/brads between the circles.